Ice cream flavors like mango, jackfruit, durian, coconut, pandan, and coffee were the ones I grew up with. My mom sold ice cream and frozen yogurt as a side job when I was very young. I was the chief taste tester and couldn’t be happier to play that role. It wasn’t until we moved to America that I was exposed to exotic flavors like cookies and cream, rocky road, salted caramel, cherry garcia, and rum raisin. We went through a period of time where a new flavor was brought home whenever my mom went grocery shopping. 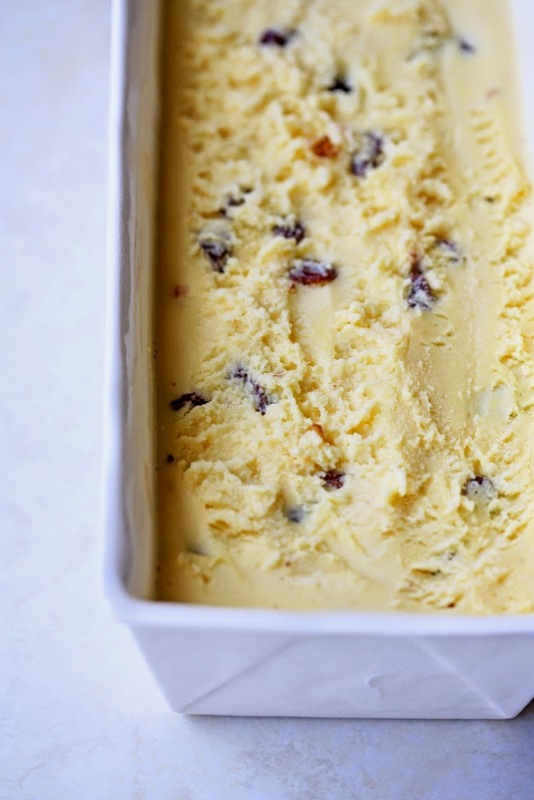 Throughout the years, one flavor has remained my favorite—rum raisin from Haagen-Dazs! The first time I had rum raisin ice cream, my taste buds did a happy dance. There’s something about that hint of rum that makes it so good! With the weather warming up and my freezer semi-empty, I decided it was time to experiment. After several batches, I found the ratio of milk, cream, egg, sugar, raisins, and rum that I like. I hope you enjoy it as much as I do! 1. 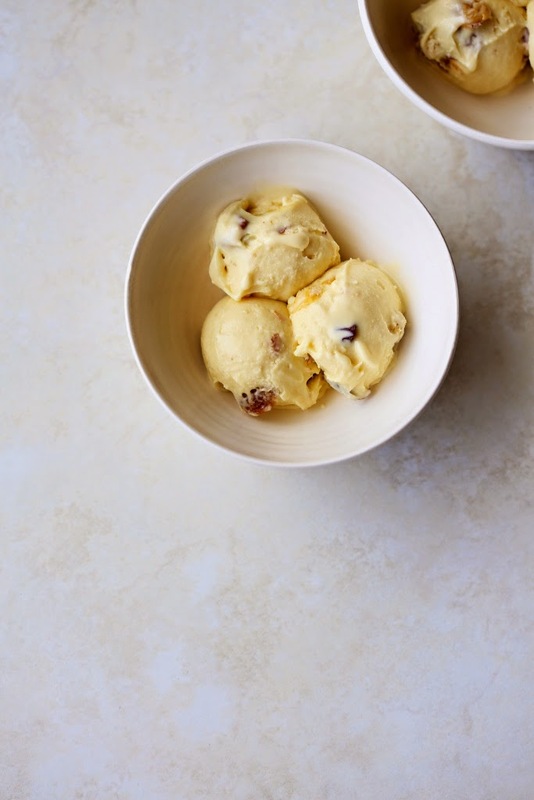 Combine the raisins and dark rum in a bowl and let the raisins soak overnight. 2. In a medium heatproof bowl, whisk the yolks just to break them up, then whisk in half of the sugar. Set aside. 3. In a heavy, nonstick saucepan, stir together milk, cream, and remaining sugar. 4. Put the pan over medium-high heat and let the mixture boil gently to bubbling just around the edges (gentle simmer). Reduce the heat to low. 5. Carefully measure out ½ cup of hot cream mixture. While whisking the eggs constantly, whisk the hot cream mixture into the eggs until smooth. Continue tempering the eggs by adding another ½ cup of hot cream to the bowl with the yolks. 6. 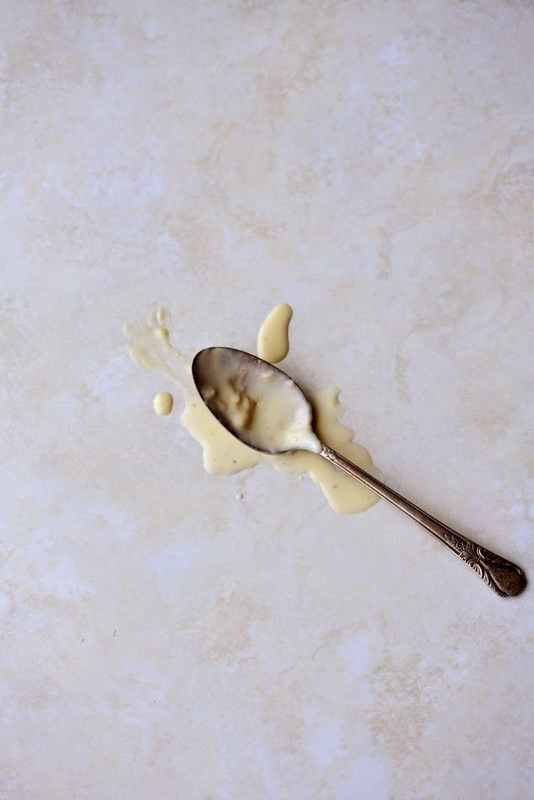 Pour the cream-egg mixture back to the saucepan and cook over low heat, stirring constantly until it thickens and coats the back of a spatula. 7. Strain the base through a fine-mesh strainer into a clean container. 8. Stir in the rum soaked raisins and 3 tbsps of rum. 9. Pour the mixture into a 1-gallon Ziplock freezer bag and submerge the sealed bag in an ice bath until cold, about 30 minutes. 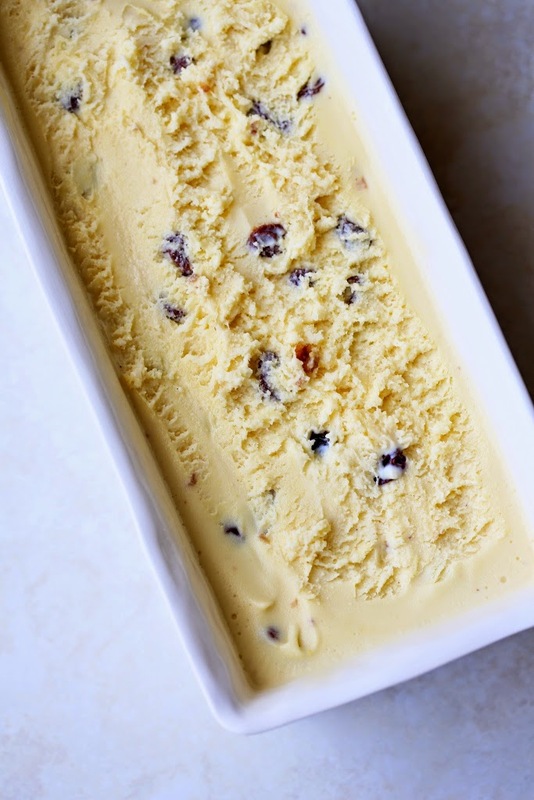 Refrigerate the ice cream base for at least 4 hours or overnight. 10. Pour the ice cream base into the frozen canister of your ice cream machine and follow the manufacturer’s instructions. 11. Spin until thick and creamy, about 25-30 minutes. 12. Pack the ice cream into a storage container, press a sheet of parchment directly against the surface and seal with an airtight lid. Freeze in the coldest part of your freezer until firm, at least 4 hours. -When you’re cooking the egg yolk-cream mixture, keep the heat low to avoid scrambling your ice cream base. 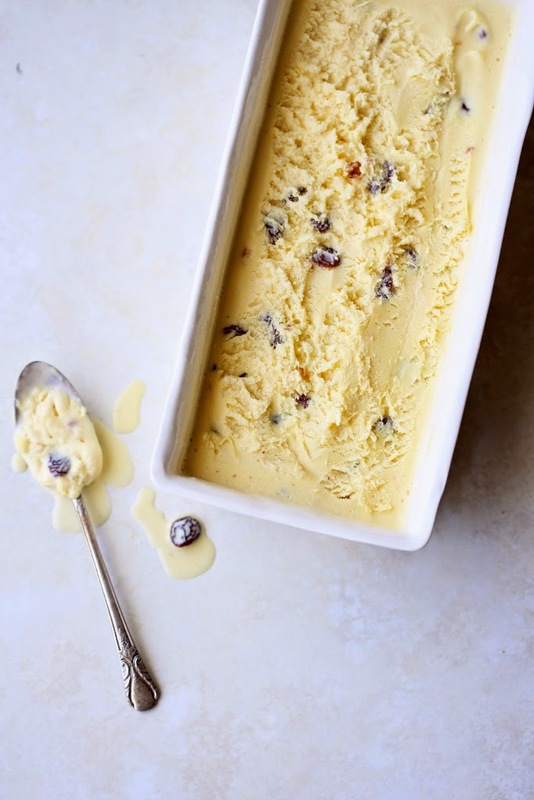 -I like to chill my ice cream base overnight to let the flavor fully develop. I have been a follower of Tara O’Brady’s blog since its beginning and couldn’t be more excited to try the recipes from Seven Spoons. After perusing the book several times, I decided to make the ones that seem the most interesting and/or delicious. Honestly, I was sold at Vietnamese coffee ice cream. Vietnamese coffee and ice cream are two of the few things that we can’t live without so it was a no brainer. After 2 hours of prepping/cooking and overnight freezing, the ice cream debuted the next day and became an instant hit. 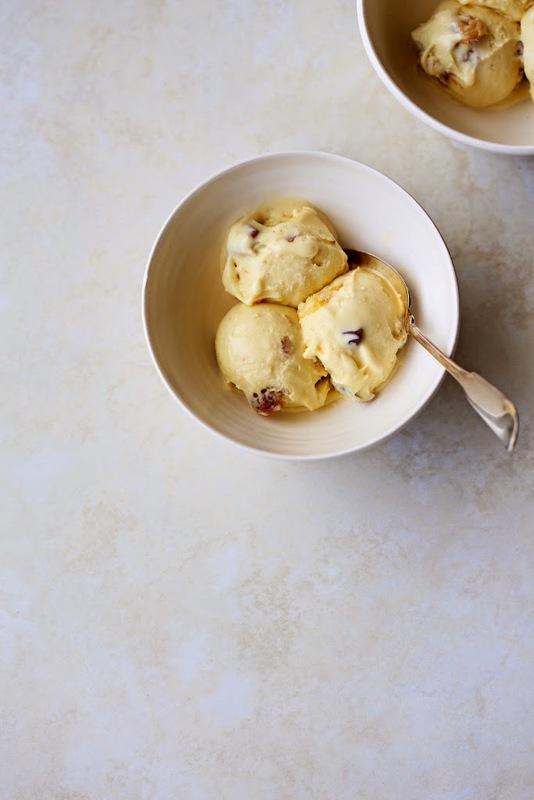 I have made Vietnamese coffee ice cream many times but Tara’s addition of caramel brought it to another level. This recipe will be added to our arsenal of ice cream favorites. The avocado toast was an easy and tasty breakfast item especially when my day begins at 5 AM with no time to make our usual noodles, eggs, or oatmeal. I skipped the sprouts and didn’t think I missed anything. And the bostocks! Where do I even begin? Bostocks are brioche slices soaked in orange syrup, slathered in almond cream, and baked until the edges are crispy and caramelized but the center becomes custardy. They were amazing and reminded us of almond croissants. Forget about making almond croissants! Bostocks are way easier to make and taste just as delicious any time of the day. I’m contemplating playing with different syrups to see how they pair with the almond cream. Last but not least, the moussaka was better than I expected. I have been using chef Gordon Ramsay’s moussaka recipe from World Kitchen for years so it was time to try something different. Tara’s recipe was spot on and more flavorful than chef Ramsay’s recipe and just as good as the moussaka from our favorite Greek restaurant. Her judicious use of spices and seasoning created a more complex moussaka. Another winner! Overall, Seven Spoons is a great cookbook with solid recipes. I love the global influence reflected in the dishes that Tara chose to feature in this cookbook–from her Indian heritage, husband’s Irish and British roots, Canadian upbringing, Middle Eastern flavors, and so much more. Her style of cooking and philosophy resonate with mine and I can’t wait to try other recipes from Seven Spoons. Franklin Barbeque is one of those cookbooks I have been anxiously waiting for since I first heard about its publication. Our friends in Texas said that Franklin BBQ opens at 11 AM but people usually line up at 9 AM and everything is sold out by noon. They vouched that Franklin BBQ is the best so we wanted to see if it lives up to its reputation. Unlike other BBQ books that are broken down into the different types of meat, Franklin organized his book in a way to teach you the concepts and technicalities for making the best Texas BBQ. Franklin started the book off with Franklin BBQ’s humble beginning or rather Franklin’s journey of enjoying BBQ as a hobby at the time he met his wife, to his first BBQ job at John Mueller chopping cabbage, onion and cutting brisket for customers, and long road to opening his own BBQ joint. I love his stories, DYI spirit, Craigslist prowling skill, willingness to get his hands dirty, and unwavering drive to make his dream a reality. His success is truly reflective of one’s grit and passion to make the American dream come true. Chapter two goes into the the nitty gritty of building your own smoker should you choose to. He teaches the readers how to build an offset smoker vs an upright drum smoker but he also included many useful tips for buying a smoker if you’re not in the DYI camp. In chapter 3, Franklin talked about the different types of wood, getting down to a molecular level which made the nerd in me smile, to provide the readers with the tools to bring out the best flavor of meat they’re smoking. With the remaining chapters, Franklin teaches the readers how to start and observe a fire, choosing the best meat to BBQ, as well as making the different dry rubs, sauces, and side dishes. We have only tried the ribs and the beans, and they turned out really good. Mind blowing ribs? Not quite, then again we are not smoking experts. We would love to eat at Franklin BBQ in the future just to compare the book’s recipes to the real deal. If you’re looking for a lot of recipes, this book will disappoint you. Only twelve recipes are included in this book which cover dry rubs, meats like brisket, pork ribs, beef ribs, turkey breast, and a few side dishes. If you’re willing to read the book from cover to cover, take really good notes, and pay attention to all the detail when you’re prepping and cooking meat, you’ll be well on your way to making darn good BBQ right in your backyard. In a way, this book reminds me of Relae and chef Christian Puglisi’s philosophy to teach concepts and techniques with the hope of inspiring people to explore and to transform the ingredients rather than restricting people to the written recipes. As Franklin quoted, “I would like somebody to take away from it the fact that they don’t need recipes… It’s all about the craft.” Franklin Barbeque is really a meat smoking manifesto that explains why wood, fire, smoke, and meat work together the way they do. We still can’t believe he put all of his insight and secrets into those pages. Many good cookbooks exist but truly exceptional ones are rare. This is one of those exceptional ones given how much depth and attention to detail Franklin brought to this book. Franklin Barbeque is truly a masterpiece from from the country’s most celebrated pitmaster. I haven’t been out in the garden for a few weeks and was really surprised at how well the herbs and passion fruit vines are doing. The mint has overgrown the garden box even though we’re only a few weeks into spring. The passion fruit vines made it through winter with lots of fruits ready to be picked, over 10 pounds to be exact! We made lots of drinks and smoothies using mint and passion fruit. 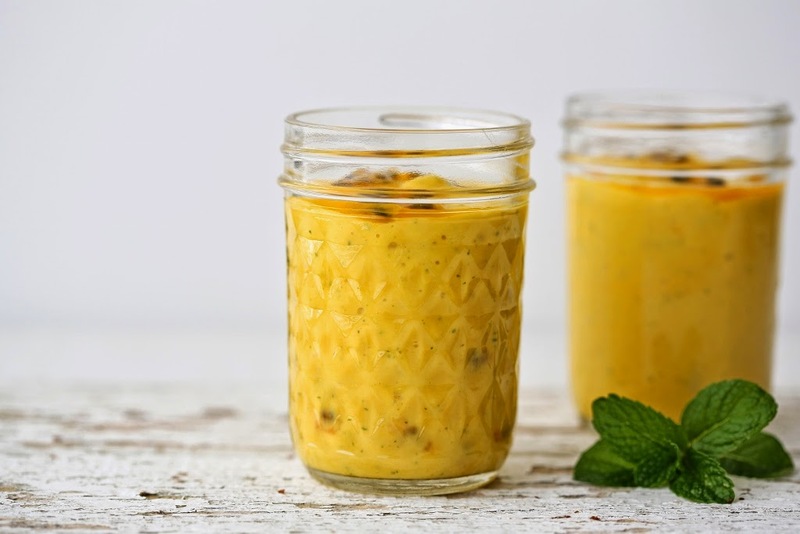 Passion fruit, mango, and mint lassi is one of our favorite smoothies. Lassi is a popular yogurt-based drink from India and Pakistan. It can either be savory or sweet, but we prefer the latter. This lassi is incredibly refreshing, especially during a hot day. 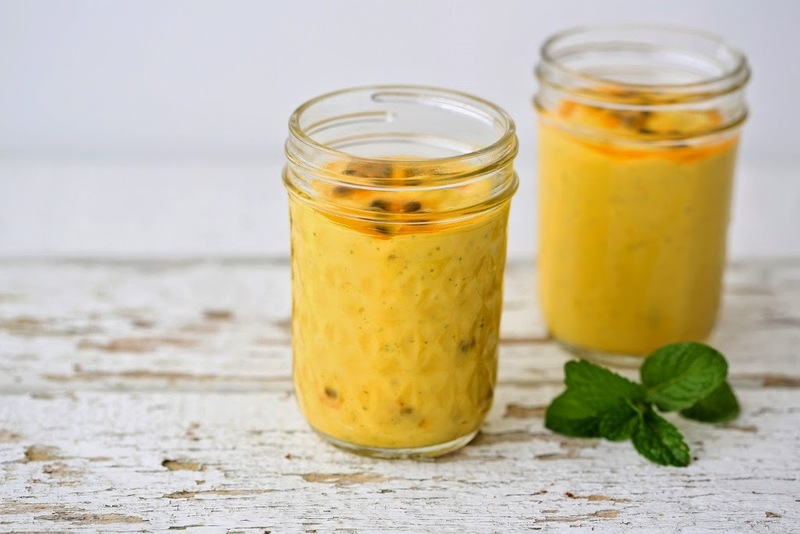 Both the passion fruit and mint give this sweet drink a kick and it totally hits the spot when you’re craving for something sweet. We’ll often whip up this lassi as a way to end a heavy meal instead of indulging in sugary desserts. 1. Combine all the ingredients in a blender and blend until smooth. 2. Taste for sweetness and add honey if needed. Divide between two glasses. 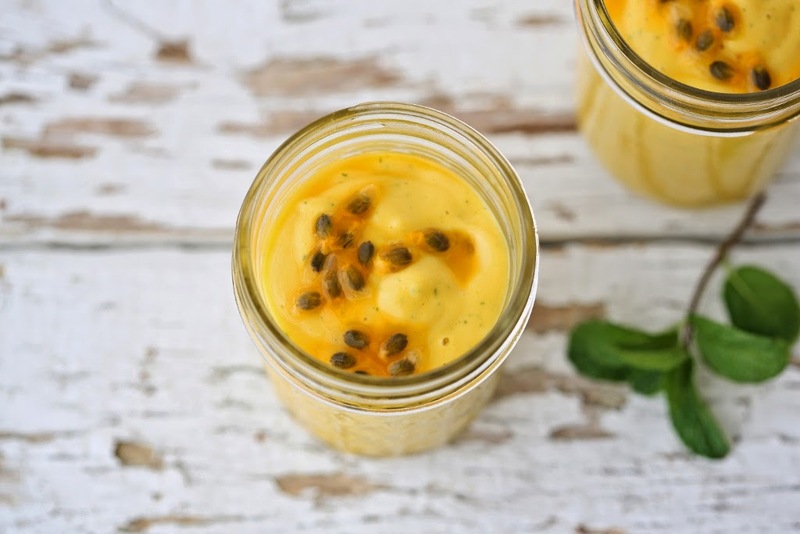 Add the passion fruit seeds on top and serve immediately. Having not known about Sarah Britton’s blog prior to getting My New Roots, I dove into this book without any preconceived notions. I loved the way she opened the book with how a yellow, pear shaped tomato changed her life. She described her experience as, “When I put the fruit in my mouth, I immediately noticed the softness and delicacy of its skin. But then I pressed it against the roof of my mouth with my tongue, and it burst into a universe of flavor quite unlike anything I ever experienced before. it was bright, fresh, grassy, sweet, and overflowing with juice. The tomato tasted off all the things that had made it–the sun, the rain, the soil, the hands that tended it.” That very moment made her realize that she is connected to what she eats and led her to a year long food immersion experience on an organic farm where she worked the land and ate what she grew. I also enjoyed reading about her experience in Copenhagen as a cook and how her blog came to be. After the short introduction, My New Roots has a quick section for essential techniques with useful information on how to cook legumes and grains, making ghee, nut and seed milks, nut and seed butter, and growing your own sprouts. Our family loves breakfast so we tried some of the morning recipes first. The strawberry coconut milkshake, raspberry breeze smoothie, and dark chocolate cherry overnight oats were delicious. I will probably use one tablespoon of chia seeds instead of two for the overnight oats since they soaked up too much of the milk and the consistency was too thick for our liking. We also tried the “life-changing loaf of bread” given its interesting name and how popular it seems. In the end it was a flop for us. Bread might have been the wrong name for this recipe. Granola bar might have been more appropriate. It was too seedy and didn’t have the texture that we would expect from a bread. Chad Robertson from Tartine bakery would probably agree with me on this one. We also tried the strawberry chamomile no-churn frozen yogurt and it was really easy to make and quite refreshing. I skipped the chamomile since we didn’t have any at our disposal. We’ll make it again with the chamomile to see how differently it would taste. My favorite salad was the roasted butternut squash with grilled halloumi and dukkah on massaged kale. The flavor profile of the salad was spot on, and it’s on rotation with some of my favorite salads for lunch. Some of the recipes that I’m looking forward to making are the apricot rhubarb clafoutis, ginger ale, pina colada passion fruit popsicles, raw cashew yogurt, fig and buckwheat breakfast tart, upside-down plum cake, banoffee pie, and blood orange chocolate cake. I initially got this book to get more ideas for planted based breakfast and lunch recipes. What took me by surprise is the number of plant based desserts that I want to try from this book. At least they’re healthier desserts, right? Overall, we liked most of the recipes that we tried so far and look forward to cooking more from My New Roots. By the way, did you enter our current giveaway for this book? Head over to this post and leave a comment for a chance to win this lovely book!